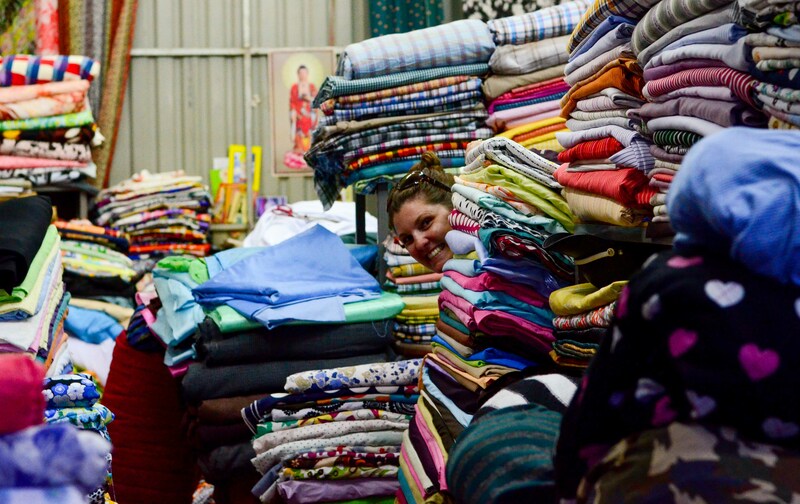 According to every guide book, travel forum, and traveler passing through, Hoi An is the place to have custom clothing made on the cheap. When asked what I planned to shop for, I replied that I didn’t need anything and didn’t want to carry it anyway. That resolve lasted about five minutes once I cruised through historic Old Town and saw what was on offer—custom tailored coats for prices that you’d be lucky to find at discount outlets back home. Suddenly I was in it to win it. Selecting a tailor in Hoi An is like surviving a gauntlet, with every shop aggressively vying for your business. “Buy something!” they scream from the storefronts and some even approach you in the street to physically coerce you into their store. First, no touching. Second, your aggression is endearing and all, but I’m going to take a hard pass. In the end, we chose to order from places that didn’t make you fear that they would beat you over the head with a nearby broomstick if you didn’t make a purchase. From there, I’ll spare you the details of my psychological journey through item and pattern selection and will fast forward to my final order: a medium-length wool peacoat, a casual wool zip-up with detachable hood, and a Lululemon-like blanket/sweatshirt number (think shortened and zipped Snuggie—awesome, I know) from three different tailors. All three items totaled $108. Yeah buddy. Gauntlet conquered. Kiera purchased three similar items, and thankfully decided to carry them on to our flight from Da Nang to Saigon as her bag came off of the belt soaked in what smelled like a dolphin’s culinary dream. Apparently it’s acceptable to check deteriorating Styrofoam containers full of prawns and other fishy goodness on JetStar flights. It was fascinating how suddenly no one working at baggage claim spoke English when we tried to file a complaint. Alas, at least Kiera had three coats to wear until all her other possessions could be washed. So what if it’s almost 90 degrees outside—those custom duds shows off her curves like a boss. Oh, and if you must know, I crashed my rented motorbike into a line of parked motorbikes while trying to park. Yes, you read that correctly. As I squeezed on my right hand break I apparently also squeezed the accelerator. Twice. It was pretty high up on the embarrassing scale, although the fact that I would never see those people again and it only cost me $7.50 to replace one break handle helped. The food cart woman across the street waited to make eye contact with me and then pointed and laughed. This initially made me angry, but I was quickly appeased by the fact that she works at a food cart and I do not. Now, how long will it take for me to receive an email from both parents warning me about the dangers of motorbikes? I say ten minutes. My custom jacket and the floor model. Weird wearing shorts and wool. PEACE – This place was recommended by Sunflower (see below) and was decent enough. 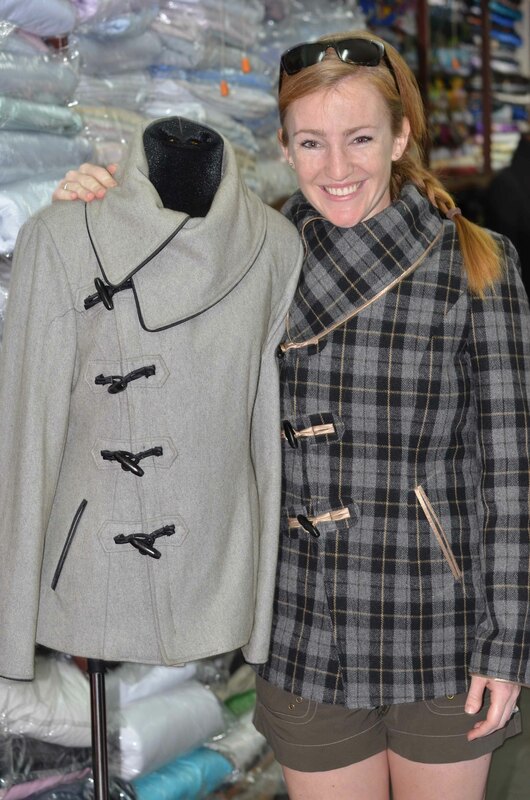 The prices were fair ($45 for a custom wool coat), but the saleswomen were a bit pushy and rushed. When I asked for a few alterations to my jacket after the “fitting” she replied, “Oh no, this much better. This fine.” I decided that it wasn’t worth the hassle, but would have been annoyed if I really had my heart set on adjustments. Mac Khai (12 Nguyen Thai Hoc St.) – We randomly checked out this shop and were pleasantly surprised that the custom wool coats were just $35, and in the end they were the same quality as those at PEACE. Kiera wanted adjustments made to her second coat and they did so within an hour, without issue. Hoi An Lodging: I stayed at the Sunflower Hotel, which is more of a hostel than a hotel. A bed in a six-bed dorm is $9/night and includes a free pick-up from the bus terminal, use of the shuttle to the main shopping districts, and a huge buffet breakfast. Solid deal. It’s often full, so book ahead. Motorbike Rental: A 24 (ish) hour rental from Sunflower Hotel is $5 plus fuel. You should be able to get away with 40-50 VND worth of gas. They don’t make you sign anything, give a driver’s license, etc. Sketchy, I realize. Always wear a helmet and avoid driving in Old Town between 4pm-6pm as it gets crazy in there. We mostly used the bikes to get to and from the beach and did a self-guided tour of Marble Mountain and the beaches where US troops were once stationed.